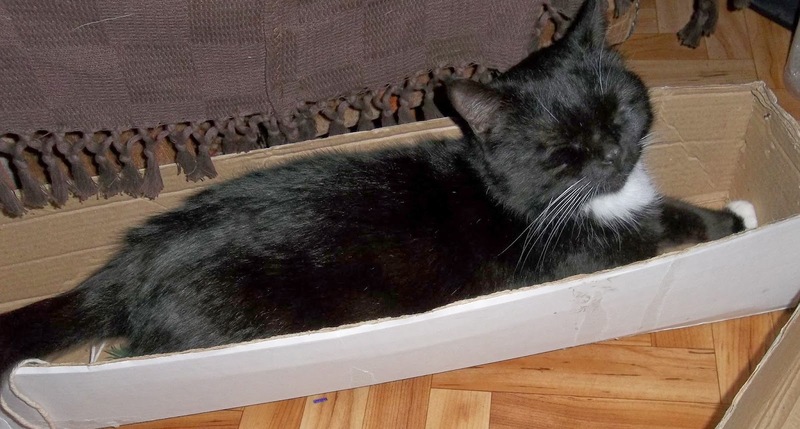 You may remember Scruffy, one of our cats - seen above, trying to squeeze into a box. He is full of mischief and outdid himself yesterday morning playing a very good joke on me. I decided to post about it today as it would have been a perfect April Fool. Imagine the scene...I had got up and was just about to go to the bathroom when something caught my eye. 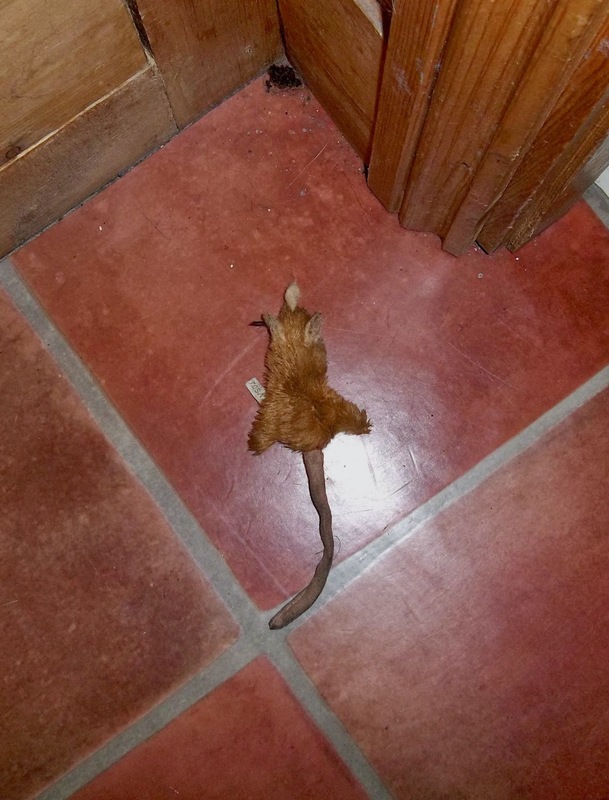 There on the floor was a dead creature - a mouse, or a shrew. I peered at it in the dim light. I wasn't sure I wanted to touch it, but knew I couldn't leave it there, so scooped it into the dustpan. In my defence, I was still slightly drowsy and it was in a dim light. However, now I'm wondering where on earth did he get it from? Has some poor cat in the neighbourhood lost his precious favourite toy? It has cat nip in it I think, because he was playing with it yesterday and could find it no matter where I put it. It still makes me jump when I see it unexpectedly! Good joke, Scruffy! Thanks, Briony. It still makes me do a double take when I see it sprawled on the floor! I have just washed it as it looked so disreputable and was probably full of germs, but Scruffy still seems to love it! Ah bless, I bet he found it in another cat's garden. 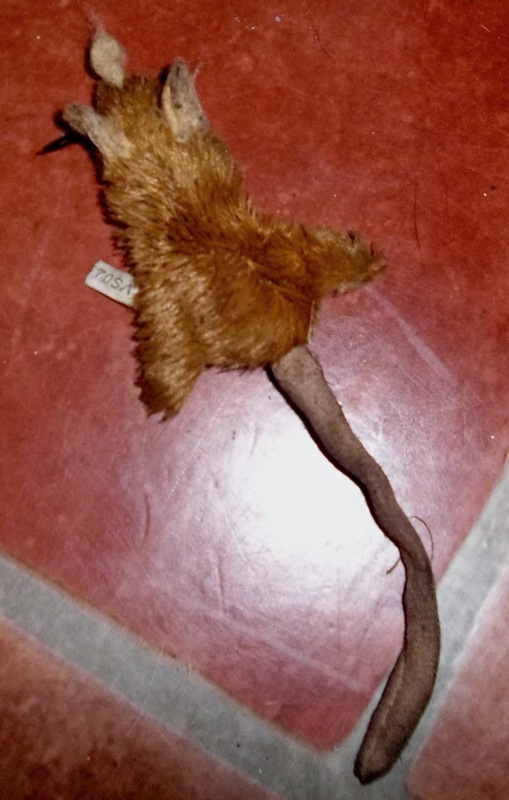 A friend of ours had a cat that found a feather duster from somewhere and tried to get it in through his cat flap! They are funny little creatures arent they? Thanks, Anne. Yes, they really are! I put it up on the side and he jumps up to get it! He has just been throwing it round the kitchen! As I said, I have had to wash it though - ugh! I think it is his favourite thing at the moment. Ha ha thats so cute, I had a cat that used to steal from a cat up the road, I had to return them all one week!! glad you are joining in with the sew-along, I hope you enjoy it when you get your pattern!! Thanks and a big welcome, Daisy. That toy really has become Scruffy's favourite thing! I am really looking forward to taking part in the sew-along but still no sign of the pattern as yet. I am hoping it turns up for the weekend as I have got everything else I need to get going. Thanks, Gillian. I must admit that I haven't disposed of it - Scruffy loves playing with it too much. However, I have washed it and put some stuffing in it too. The things we do for our pets! Haha, so he got himself a new toy to surprise you! Thanks, Mirjam. Yes he did and we still don't know where he found it! It was quite a surprise! He is a very mischievous little cat.